Catholic Relief Services ("CRS") is contributing to the disaster relief following the devastating Myanmar cyclone. Funds provided by CRS are going through Caritas Internationalis, which is working in the most affected areas according to an article posted by CRS. CRS accepts donations online. Click on the "Donate now" link on the home page of the Catholic Relief Services website. Caritas Internationalis has more on its website. Caritas is a confederation of 162 Catholic relief, development and social service organizations in over 200 countries and territories. Network for Good lists CRS and other relief agencies that are assisting in the relief effort, with links to donate to them online. CNN article: "Limited Cyclone Aid Begins Moving." I thought it might be helpful to some people if I would share some thoughts about rebuilding, shopping to replace items, and accepting help from others after a catastrophic disaster loss. These are based on my experience after the Oakland Hills Fire and the experience of other people I knew. This is not a post about surviving, but rather an honest post for people who have replacement cost insurance. It is about about things like negotiating with your carrier, replacing lost collections, and buying new furniture. Keep in mind that some things may have changed since the Oakland Hills Fire 16 years ago, and that any insurance settlement will depend upon the specific terms of your own insurance policy and the practices of your own carrier, which may be different from what is discussed below. Anyone shopping for gifts for disaster victims may also find some of this information useful. Replacing Houses. I wrote about the immediate issue of temporary housing in an earlier post. Once you are settled in temporary housing, you will need to begin rebuilding. If you lived in a fire hazard area and want to stay there, consider learning what you can about fire-resistant construction when you start planning the design of a new home. In the Oakland Hills, many people rebuilt larger homes than they had before, which in some cases left a less beautiful hillside neighborhood than was there before the fire, especially without trees. If you do not have a neighborhood owners' association, it may be a good time to form one to share information and to coordinate your designs with each other. If neighboring homeowners all want to replace trees, but do not have the same kind or amount of greenery in mind, or have very different architectural ideas in mind, it would be worthwhile to know that before the homes and landscaping are in. You may want to negotiate and make association rules about fire-resistant roof design, building colors, landscaping, and other things that affect everyone's fire safety, home value, and the overall appearance of the neighborhood to be rebuilt. Replacing Condominiums and Townhouses. This is more complicated because the homeowners association, which actually owns the buildings and grounds, will have one insurance policy while each homeowner, who owns the space inside the walls and their personal property, has another. You may have 50, 100 or 200 people who are members of the homeowners association and need to decide on a design to rebuild. While your condo insurer may give you a check, it will not cover your interest in the homeowners association's property. For that, you will either have to get involved and make your voice heard about the design or try to sell your interest in the complex. If one large insurance carrier issued the association's policy and also issued policies for a number of the individual homeowners, that carrier may be interested in negotiating to purchase the individual homeowners' interests in the association's property. It may be to the carrier's advantage to buy out the owners in order to have control over the design and construction of the replacement building. That may take several months, as the carrier's obligation is really just to pay to replace and repair the association's buildings and improvements, and the carrier may not rush in if it appears that the homeowners and their board are agreeing among themselves and making progress toward their own rebuilding. It will depend on the terms of each insurance policy and will depend on the homeowners in each particular complex. You may have some negotiation ahead of you either way. Think about reading a couple of books to boost your negotiation skills before it all gets underway. Bargain shopping for furniture. After the Oakland Hills Fire, a lot of furniture stores and department stores in the area offered significant discounts, and sometimes free delivery, to fire victims. In one case, shopping the department store sales, I found a beautiful dining room table that was marked half price, with an additional 10% off of that for a one day sale, and an additional 10% off that for a fire victim discount, free financing for 1 year, and free delivery. I saw the same table, with slightly different chairs, on the cover of House Beautiful magazine in a later issue. If you have more insurance than you need and your carrier is paying for each item as you buy it, it may not make much difference. But if you already have an insurance settlement check based on an estimated replacement cost or policy limits, shop the sales. If you do not find fire victim discounts in your area, you might want to check stores near another fire area to see if you will find such discounts elsewhere. With fires ranging across three large counties, there are a lot of fire area stores that may have different policies. Linens and Other Department Store Items. You may find fire victim discounts for these items too. Shop around. If you shop soon after the fire, expect that sales clerks will want to help you find the best prices. If you are a frequent customer of a particular store for this sort of item, phone and let the owner or manager know that you have had a loss and need to replace everything you bought there. They may set a few things aside for you to show you when you come in. Antiques and garage sales. Having a new home full of furniture, dishes, and everything else all designed and bought in the course of the same month can look and feel cold. To give a home a feeling that it has been lived in and loved, a sense of history and life, buy some things from earlier decades or even from earlier centuries. Antique -- or just older -- candlesticks, artwork, a bookcase here or a table there, can make a big difference in the feel of replacement furniture. Used books replacing the ones you lost will never give you the same feeling as the copies of those books that you actually read, but will make a book lover feel more at home than having no books, empty shelves, or all new unread copies. Arts and crafts. Look for crafts festivals and town crafts fairs that abound at this time of the year as a source for unique lamps, quilts, and reasonably priced original artwork. (I will try to look for these and add them to the Blog by-the-Sea Calendar in the sidebar.) Specialty stores that carry unusual home decor items will be picked over quickly by other fire victims, so you may want to actually start there, looking for the better items before they are sold. If you are a frequent customer of such a store and know the owner or manager, phone as soon as you can and let them know that you need to replace the things you bought there. The manager may set aside some of the items you will like to make sure they are held until you get there. Collections. Building a collection of anything takes years, and if it is lost it can be painful. Rebuilding a collection can give you something fun to do at a painful time. A week-end trip to the Gold Country's small towns, with roads of antique stores, may be a welcome respite and an opportunity to quickly replace part of a lost collection and choose some unique items to give your new home a feeling of character. Just as a week-end trip to an antique-laden destination may make a collector feel at home again quickly, a trip to a gallery-rich destination may help an art lover. Check for upcoming art shows and auctions. The same goes for other collection shows: button shows, quilt shows, etc. Walk through neighborhoods near arts colleges, where art students may sell their work in cafes and small galleries. Phone university art departments and ask if they can tell you where their art students sell their work. Gifts. People will want to know what they can give to help you, even if you do not need the help financially. A club, choir, or co-workers may want to plan a shower. I found that the easiest thing was to ask for kitchen items, and I prepared a list so that people could share it and check off what they wanted. Another good idea is to ask for Christmas tree ornaments and decorations, because Christmas is coming up soon and you will appreciate having a variety. You can build a wish list on amazon.com or a department store shower list so that people will know what you want and what someone else has already bought. With kitchen and Christmas items, there is no risk of someone buying something that does not fit your color scheme, or the wrong size, or anything else you will need to return. Also, the variety of things you need cover a wide range of prices and you will appreciate both new and used items, so there are gifts for everyone's budget and price range. One person may give you a couple of pretty mugs from their own home, another may spend hundreds of dollars for a truly beautiful item. My gifts included a bunch of wooden spoons and a couple of dish cloths tied with a ribbon, a couple of home-made Christmas tree ornaments, a collection of beautiful and high quality serving dishes that someone gave me from the wealth of their own home, a top quality carving knife, two beautiful top quality springform pans, all of my department store shower list of place settings, and so forth. In no time, my kitchen was replenished with minimal shopping on my part, and I appreciated all of the gifts both small and large. Someone later complimented me for the idea because it suited everyone's budget for people with a broad range of income levels, and the choices were easy. Photos. Check with family and friends who may have photos from family and social events you shared. Ask them to let you have prints made for yourself to replace photos you lost. Think about having some of them printed in larger sizes for frames. Photos you have saved online or on a laptop you were able to save can usually be printed by a camera store. If you are hoping to give something to someone who had a loss, photos can be a most welcome gift that cannot really be replaced by insurance money. Recordings. You may have lost a collection that will be difficult to replace because some of the music is no longer readily available in the stores. Check with friends who may share your love for music and who may be able to make a copy from their own collection. Also, try sources like ebay, amazon, and other sources where you can buy used recordings as a source for any music you find difficult to replace. Replacing the music you had before the disaster can be a great improvement. Disaster Relief Centers. Avoid these like plague. Do not register with FEMA or any other relief agency if you have insurance to pay for your temporary living expenses and do not need a loan to repair your house. Most people in southern California probably had adequate insurance after the fires we had 4 years ago and have no use whatsoever for anything provided at these centers. You can replace your Social Security card, get copies of past tax returns, and so forth without having to go through that process, which may be deeply stressful. Other people who want to help you may encourage you to go, but don't do it. If you sign up, you will have to follow up (and be followed up on) by state and federal agencies that are trying to provide unwanted assistance. They are under pressure to show that they have helped people, and they will drive you nuts until you finally get rid of the would-be "helpers." You may even find yourself in trouble if you go down there. Well meaning volunteers will want to fill out forms for you and "help" by checking boxes for assistance you do not want or need or by estimating your income or loss a bit higher than the numbers you gave them. Small insurance claims. You may be in luck if you call your carrier right away. Insurance carriers are short staffed in the days following disasters, and they are under much pressure to show that they have resolved a percentage of claims quickly. If you have your records and photos of your personal property, you may get a very quick settlement which is money you can then take shopping for bargains. Large insurance claims. The claims that will take the most time for carriers are those from people who owned valuable works of art, antique car collections, and other one of a kind items that are difficult to value. If you owned a lot of those items, realize that you are going to have to reach a settlement on the value of each of those lost and irreplaceable items. If your accountant has recent estimates, you may want to contact the estimator and make sure that he or she still stands by the same estimate. Recent auctions of comparable items may have brought in higher or lower prices that would change the estimate -- possibly in your favor. You may need to fill out a lengthy inventory of lost items for the insurance claim, so get your appraisals, photos, videos, and receipts in order and contact your accountant, appraisers, and insurance agent for help to get started. The better you can document the amount of your loss, the more confident the adjuster will be in your claim when you submit it. As you visit the antique stores, crafts fairs, and other sources mentioned above, look for merchants who have an expertise in any items that you have not had appraised. Ask antique merchants, for example, if they can help you with appraisals for your insurance claim. They may initially be fearful that you want them to place a high value on everything, or concerned that it will take more time than they have available. They may be pleased to help once they understand what you need. They may also have the network to help you find others who can place values on your lost items. Here are some links for information related to last yesterday's severe storms in central Florida. For people looking for family and friends, this Orlando Sentinel article has phone numbers for those with loved ones in the area. This USA Today (AP) story has a map and better specific information on the exact locations affected than some other news stories offer. See more links below. The tornado struck from 3:10 to 3:30 a.m. Friday morning, north of Orlando. At least four recent thunderstorms have also affected the area. Disney World was not affected. One of the worst hit towns is known as Lady Lake in northwest Lake County, 40 miles northwest of Orlando. There, 7 people living in mobile homes presently are known to have died. Another area badly hit is near Paisley in eastern Lake County. The damage is reportedly over a wide area, destroying more than 1500 buildings in Sumter County and Lake County. Much of the area is rural. Rescuers are currently going door to door looking for people who need to be rescued. Disaster workers do not yet know how many other people may have been killed or injured, as the damage is over such a wide area and the search for survivors is expected to continue for several more days. Catholic Charities Orlando accepts credit card donations online. Be cautious about donations to agencies that discourage earmarking for a particular area or disaster. See this post about past problems with donations intended for one disaster ending up elsewhere. And, of course, be wary of e-mail scams. Here are a few links related to the Esperanza Fire that is still burning in the San Jacinto Mountains near Palm Springs and the firemen who were killed or badly burned there yesterday. The reward for information leading to the capture of the arsonists is now $500,000. Witnesses reported seeing two young men, who were thought not to belong there, walking away from the place where the fire started at 1:00 a.m. The Palm Springs Desert Sun has set up a page where people can post their thoughts and condolences on the deaths of the firefighters. Most of the thoughts there are from local people, and a few are from readers from other states, Canada and the U.K. Another page on the Desert Sun website has a timeline, updates, and links to videos. See the front page for links to more information. The Riverside Press-Enterprise has a page dedicated to the inland wildfires with links to much recent coverage, as well as links to videos, photos, and graphics related to the fire news. That page links to information about the Esperanza fire and also information about other southern California wildfires in the area going back to the major 2003 fire season. See also the Press-Enterprise front page. The U.S. Conference of Catholic Bishops has scheduled a special collection in all Catholic parishes in the U.S. for next week-end, August 26-27, 2006, to collect funds that are greatly needed to rebuild churches, schools and other buildings owned by the Catholic Church in the Archdiocese of New Orleans and the Diocese of Biloxi, which were badly damaged last year in Hurricane Katrina. An announcement on the USCCB website is here. In the Archdiocese of New Orleans, Archbishop Hughes reportedly has estimated $52 million in uninsured flood damage on buildings they would like to open now, and another $70 million in uninsured flood damage affects buildings that cannot be opened yet. 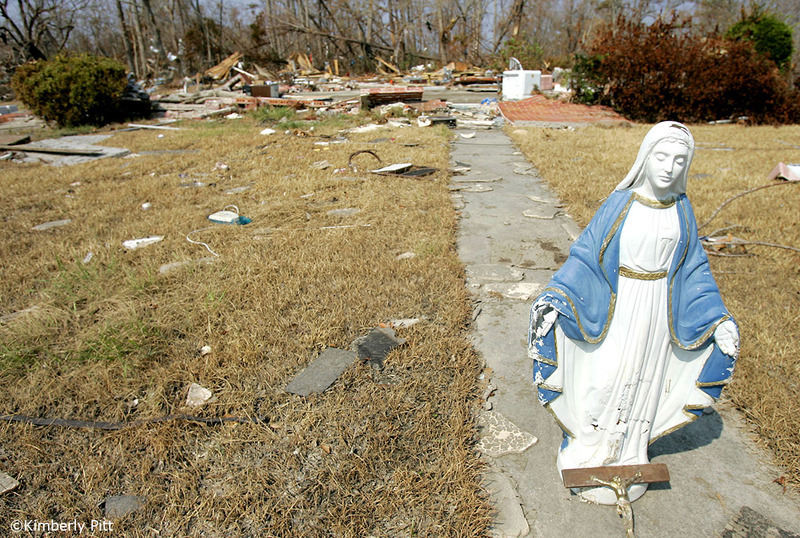 In the Diocese of Biloxi, Bishop Rodi reportedly has stated that 428 out of their 433 Church-owned structures were destroyed or severely damaged, and the uninsured loss is about $35 million. Please keep these needs in prayer and also remember to bring a contribution to Mass with you next week-end, August 26-27, to help replace and repair Catholic church buildings damaged and destroyed by Hurricane Katrina. The Diocese of Biloxi website also allows online donations and offers an e-mail address to send other offers of assistance and inquiries. In related news, a few weeks ago, the Catholic Herald reported that Catholic Charities in Louisiana and Mississippi still needs volunteers to help clean up and repair homes damaged or destroyed in Hurricane Katrina one year ago. Some of the residents are still living in tents and trailers waiting for aid. Also, Catholic News Service had a recent article concerning Providence Community Housing, a Catholic organization assisting those in need of housing in the hurricane area. This past Tuesday, August 16, a judge held that wind-driven water damage is not covered under standard homeowners insurance, answering one of the coverage issues raised by Katrina victims concerning their insurance coverage. Other cases are still pending concerning coverage issues. Meanwhile, as insurance carriers consider anticipated future risks when they set premiums and make decisions about which risks to exclude on new policies, Louisiana Governor Kathleen Bianco has raised concerns about keeping the major insurance carriers in the state despite the risk of future hurricanes. Carriers have said that they want to continue to write insurance in the Gulf Coast states, and that stricter building codes in those states may further that effort to keep insurance at affordable rates for risks that are covered by standard policies. Thus, Catholic parishioners and other residents who did not have flood insurance sufficient to cover their losses are also facing financial hardships at the same time as so many Catholic churches and schools are facing uninsured losses and costs that exceed the amount of coverage. Stronger building codes will likely increase the costs of repairs and rebuilding, but will also result in more stable buildings that will fare better in future storms. Accordingly, Catholic parishes and also individual parishioners in the Hurricane Katrina area are still in need of assistance and prayer. The Red Cross and Katrina: Is the Investigation Sufficient? "The Louisiana attorney general has launched inquiries into two of the country's best-known charities -- the American Red Cross and the Humane Society of the United States -- after receiving complaints that they misused some of the millions of dollars they raised in the fall to help the human and non-human victims of Hurricane Katrina. "Attorney General Charles C. Foti Jr. plans to announce tomorrow that he is looking into allegations that Red Cross volunteers diverted money and supplies meant for hurricane victims in New Orleans, spokeswoman Kris Wartelle said." If true (which has not yet been determined), it won't be the first time. It won't even be the first time that the Red Cross has been in serious trouble for doing the same thing and has promised not to do it again. And again. "The Red Cross continues to release detailed figures of its aid expenditures after October's fires in an effort to rebuild trust lost three years ago when spending scandals forced an overhaul of its management." The appearance is always that it was a problem in one local office and that it was corrected and will not happen again. But 2001 in San Diego was not the first time or the last. Something similar happened to the funds earmarked for earthquake relief after the 1989 Loma Prieta Earthquake in the San Francisco Bay Area. Of $52 million in funds donated for earthquake relief in San Francisco, only $22 million was actually spent there (see here). I lived in the San Francisco Bay Area at the time of that earthquake. I was surprised when people again donated money to the Red Cross for fire relief following the Oakland Hills Fire in 1991, just two years later. However, the Red Cross was assuring people that it had solved the problem in the mishandling of funds donated for the 1989 earthquake, and that the problem would not happen again. But it did, in San Diego about a decade later, and I was living in San Diego in the aftermath watching the Red Cross promise, two years later in 2003, that it would not happen again. Again. This is not merely a local problem in New Orleans, San Diego, San Francisco or anywhere. Indeed, on October 28, 2003, the Union Tribune reported that local Red Cross officials in San Diego had stated that it was the Red Cross national office that was discouraging people from earmarking funds for one particular disaster (read here). After the New York Times story about the New Orleans investigation, the Red Cross released a statement on March 24, 2005. According to a New York Times March 25 article, the following day, the Red Cross fired two key administrators handling Katrina relief. The statement promised that the Red Cross takes seriously reports by concerned volunteers, and that it was assisting law enforcement. A March 30 Red Cross Press Release reported that the FBI would take referrals from the Red Cross of possible fraud by the organization's volunteers in the Katrina relief. "The Red Cross needs to do more than track down the missing inventory and figure out who's responsible. The organization needs to look at its own sluggishness in responding to complaints and the mistreatment that whistleblowers say they faced." In the U.S., our investigations have generally concentrated on the Red Cross's failure to account for funds raised by people whose intent was to donate money to help the victims of a particular local disaster. The current investigation follows that pattern, seeking to determine whether there has been criminal action by the Red Cross, or by some of its many Katrina volunteers, related to the handling of funds donated for Katrina victims. However, outside of the U.S., disaster relief is not the only area in which Red Cross mismanagement has prompted scandal. The Canadian Red Cross was forced out of its roll in handling Canadian blood donations after a different kind of scandal involving more mismanagement. BBC News reported on May 31, 2005 that Red Cross officials pled guilty for using HIV positive blood donations in a Canadian tainted blood scandal. In 1997, according to that article, a public investigation so criticized the Red Cross's handling of Canadian blood donations that it was stripped of that function and replaced with a government agency. Thousands of people in Canada contracted HIV or Hepatitis C as a result of Red Cross mishandling of the country's blood donation system. The U.S. investigations continue to concentrate on Red Cross handling of donations. The Red Cross continues to handle U.S. blood donations. However, their handling of the U.S. blood system should be far more thoroughly investigated than has been the case. The Red Cross role in handling the U.S. blood supply gives them greater trust and name recognition than a disaster relief charity would otherwise have. It raises funding with the same logo associated with protecting the blood supply for the entire population in day to day life. That name recognition and trust enables the Red Cross to raise more money for disaster relief, and yet, time and again, there are questions raised of criminal improprieties in the Red Cross handling of those funds. After the Canadian government concluded that the Canadian Red Cross should not be trusted to handle the blood supply there, I wonder if the Red Cross does a better job of managing the nation's blood supply than they do of managing disaster relief. Personally, I am convinced that the U.S. blood supply would be greatly improved if the Red Cross was removed from its handling. After years of telephone calls, despite my repeated requests that they stop phoning me, I cannot help but think that many people are reluctant to donate blood because of the resulting lack of privacy from the Red Cross telephone solicitations. In an era where there are "do not call lists" because so many people object to invasive unsolicited telephone calls, it is reasonable to wonder whether the frequent blood shortages reported in the news are the result of the Red Cross solicitation methods and mismanagement. The investigation beginning in New Orleans ought to be far more widespread than is probably being planned. Not only the Katrina donations, but also the handling of the blood supply needs to be included. And after a series of scandals in different cities, in different states, in different countries, the functioning of the entire Red Cross, nationally and internationally, ought to be the subject of far more extensive investigation and auditing in the United States as a whole.